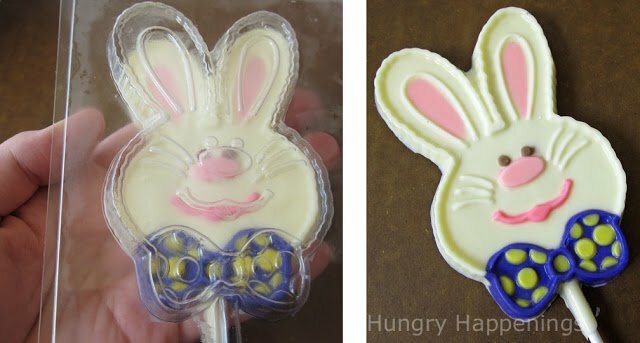 Learn how to color white chocolate or confectionery coating (candy melts) to use to paint candy molds or decorate handmade chocolates. It’s easy and fun! Before your read this information about how to color white chocolate and confectionery coating, you might want to read the Chocolate Making Tips page that gives all the detailed information about different types of chocolate and how to melt them. Pure white chocolate is off white or even cream colored and can be colored using food coloring that is specifically made to color chocolate. Confectionery coatings, which are also known as Candy Melts, Candy Melts, Melting Chocolate, Almond Bark, or Candy Coating are available in white, which is typically off white, and bright white, which is a true white color. Confectionery coatings are also available in a rainbow of colors. If you need to use a large amount of one color I suggest buying the colored wafers. If not, then you can just melt down white wafers and color them yourself. Some colors are hard to achieve, however, like dark red and green, so I also suggest buying the colored wafers. To color white chocolate or confectionery coating, first you need to melt it, and temper it, if using pure chocolate. See the Chocolate Making Tips page for detailed instructions. Do not use liquid food coloring or icing coloring (water based coloring). 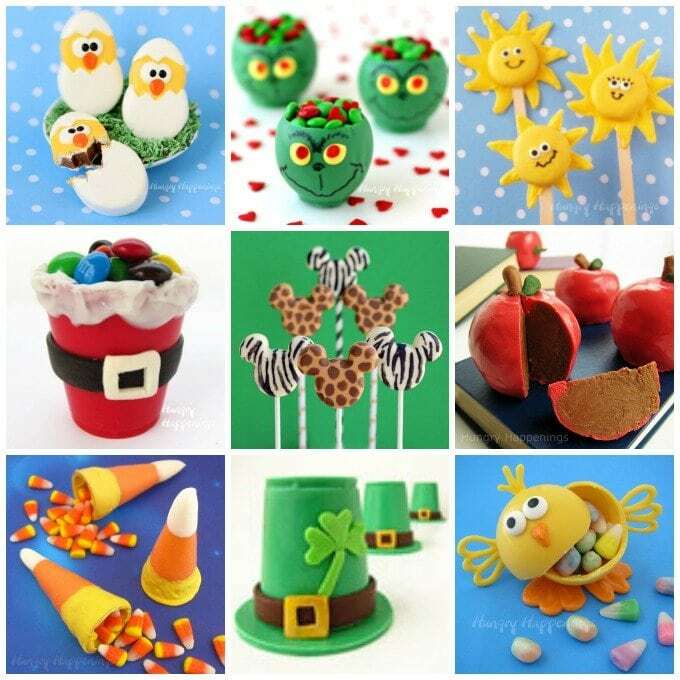 Candy coloring can be found at craft and cake decorating stores or online. 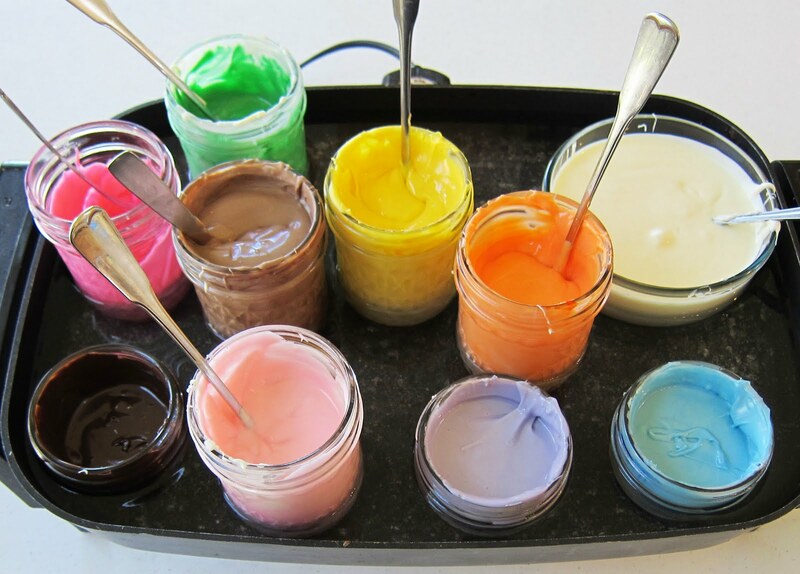 If you are using candy coloring in a squeeze bottle, squeeze in a small amount of coloring at a time and stir well. Add more coloring if needed to achieve the desired shade. If using powdered color, sprinkle some over top and stir in. Add more as needed. 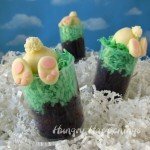 If using candy coloring that comes in a jar, insert a toothpick into the coloring then insert that toothpick into your jar of white chocolate and stir. Then remove the toothpick and throw it away after it’s first use. If you put it back into your jar of coloring you will contaminate the coloring. If you add coloring and your coating becomes thick, add a small amount of Paramount Crystals or Wilton Candy Melts EZ Thin, stirring after each addition until thin and smooth. These products are solid fats that will help thin your candy coating, but still allow the coating to set up hard. In a pinch you can add shortening or vegetable oil, but the candy might be a bit soft when hardened. Pure white chocolate and many types of white confectionery coating are not pure white, they are more cream colored which will effect the final color of your candy. If you want true colors, you’ll need to purchase bright white candy coating. Candy colored bright pink or lilac will fade. Don’t ask me why this happens, but it does. I suggest purchasing colored pink candy wafers. They will hold their vibrant color and wont fade nearly as much. *You can also use a crock pot, but the skillet has more room and the lower walls make it easier to access the jars of candy coating. You can find these supplies on Amazon. 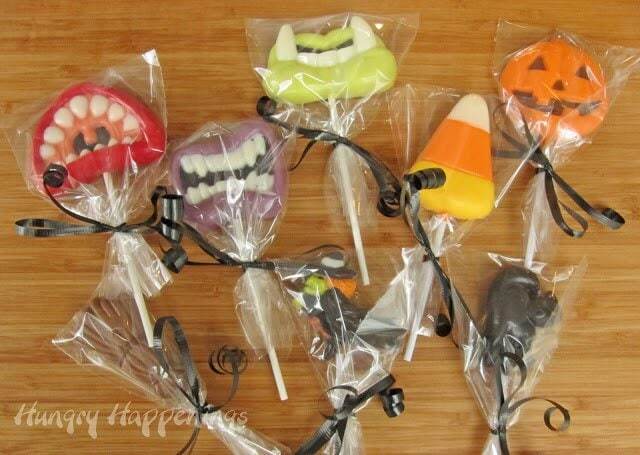 Lollipops can be made for any occasion. 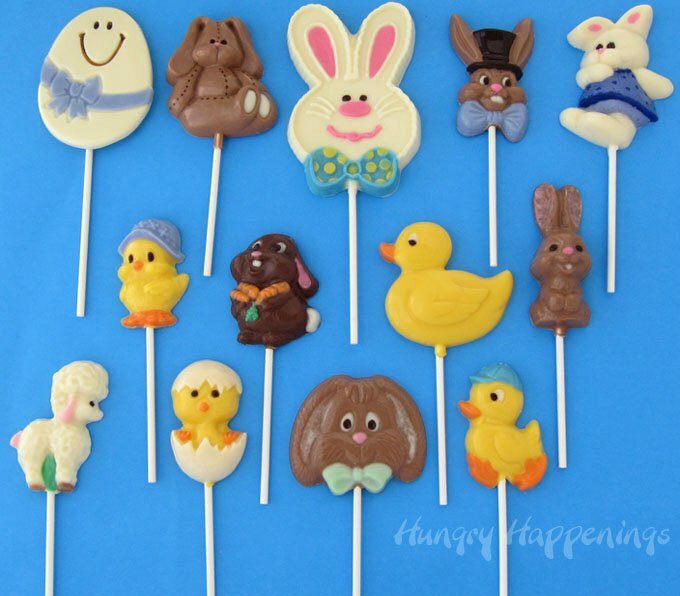 One of my absolute favorite holidays to make candy lollipops is Easter. 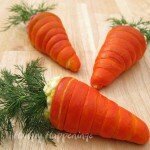 You can also use this same chocolate painting technique to make other items like chocolate Easter bunnies, adorable lambs, cute carrots, sweet chicks and more. I have even been successful in painting confectionery coating onto the molds then filling them with pure milk or dark chocolate. On occasion the candy doesn’t adhere to the mold then to the chocolate properly, but for the most part it works. 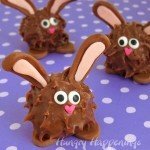 I do have to “glue” some bunny noses back on when I’m making Easter chocolates. I also will used edible luster dust to add color to my chocolates. You can see the ears on the bunnies at the bottom of the image above are slightly shimmery. They are decorated with luster dust. I also enjoy making chocolate suckers for our Halloween party. They make fun party favors and prizes. I will package them in clear cellophane bags then tie them with a ribbon. That way my party guests can take them home. Fill an electric skillet with some hot water and set the temperature to “WARM”. Fill glass jars, coffee mugs, or ramekins with the confectionery coating wafers and allow them to melt. Place the jars in the water filled skillet. Make sure the water comes up about half way on your shortest jar. As the wafers heat up, stir them occasionally until smooth. You can melt the candy coating in the microwave then set the jars in the skillet if you’d like to speed things up. Then pour the melted candy into the jars and set in the water bath in the skillet. You can keep your candy coating melted all day using this method, just stir the coating throughout the day to keep the coating near the top of the jar from hardening. And be sure to replenish the water with more hot water as it evaporates. Most importantly, be careful that you don’t spill water in the chocolate, or it will seize up and become too thick to use. So, if you pick up a jar to move it closer to you, put a towel under the jar as you move it, so drops of water don’t end up in other jars of coating. Create all of the colors you want to use in your lollipops. For Easter, I like to use pastel colors for some of the pops and more vibrant colors for others. You can adjust colors while you are working by adding more coloring (for brighter colors)or by stirring in some white candy coating (for more pastel colors). Get your candy molds and paintbrushes together and clean out your freezer, so you have some space to place the molds. Before you begin painting, decide what colors you want to use for the features and what color you want for the background. If you choose to make a white bunny, do not paint any of the features white, as they will just blend into the background color. You can paint all or just some of the features on your mold. Here I started by painting the mouth with bright pink coating. Dip a paintbrush into the coating and dab it into the indentation on the candy mold. Add more coating to your brush as needed to fill in the entire indented area. By dabbing the chocolate (see the pink spot at the top of image) you will end up with a nice opaque area. 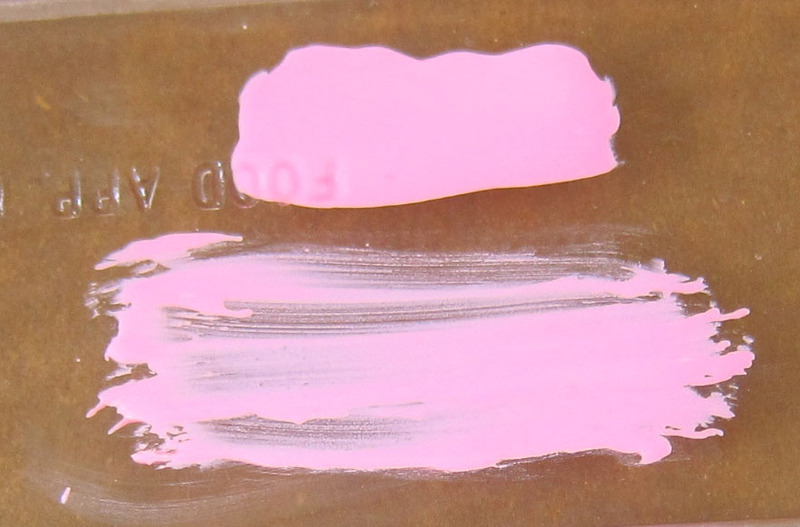 If you brush the chocolate on (pink streaks on bottom of image), it will harden, streak, and leave you with a see-through area. Also, always dip your brush into melted chocolate and not along the sides of the jar, so that you get nicely melted chocolate. If you end up with hardened chocolate on your brush, just dip it in the melted chocolate and allow it to sit for a minute to melt away the hardened chocolate from the brush. Use a different paint brush for each color then paint more details on the candy mold. I used a lighter pink for the bunny’s nose and milk chocolate for the eyes. 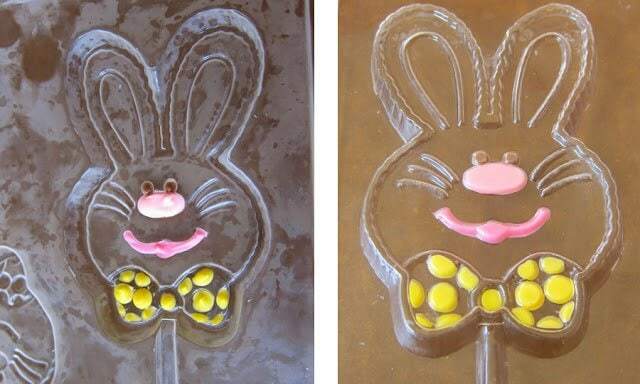 In order to layer the colors, like I did in the bunny’s bow tie, first paint on the yellow polka dots, then put the mold into the freezer for 2-3 minutes to harden the yellow dots. Any time you want to create layers of color, start with the color that will be on top, in this case the polka dots. Then remove the mold and allow it to warm up so that the frost goes away. 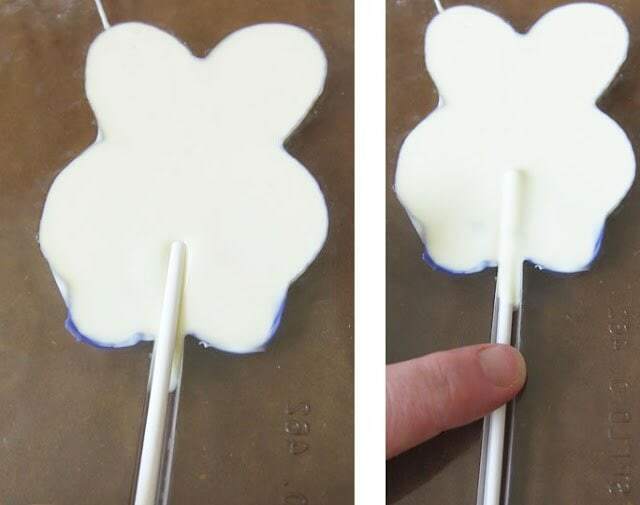 If you start to paint while the mold is too cold, the candy will want to “fly” and stick to other parts of the mold. Then paint the background color directly over top of the other color. I painted purple over top of my yellow polka dots. Carefully turn the mold over and look to see if you have covered the entire area. I have a bit of purple yet to paint onto my bow tie (see the lower right side of the bow.) After fixing the bow tie, I painted the ears (not shown) then put the candy mold back in the freezer for a few minutes. Before filling the mold, allow the mold to warm up to room temperature. Then spoon whatever colored coating you’ve decide to use for the background into the mold. 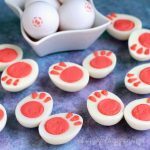 I usually spoon some in, then tap the mold gently on the table, allowing the candy coating to spread and fill in areas like the ears. It’s best not to overfill the mold, so tap gently as you go. 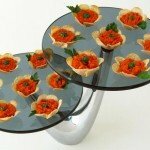 Once the mold is filled, you need to tap it on the table a few times to remove any air bubbles that may have formed. Don’t fill in the indentation that is for the lollipop stick. If you do overfill your mold, you can use your finger to wipe off the excess candy or wait until the candy is hardened and you will be able to shave it off with a knife. 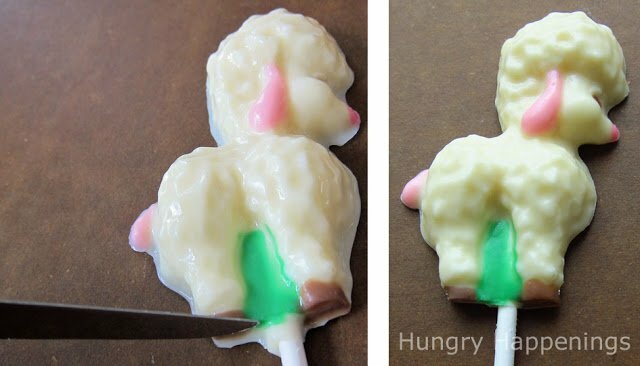 Add a lollipop stick by setting the stick in the indentation and gently pressing it into the candy. Use your finger to roll the stick around so it gets completely coated in the candy. Place the lollipop in the freezer for 5-8 minutes. It may take a bit longer, if you are opening and closing your freezer a lot during the process. As the candy coating cools and hardens it will shrink slightly and retract from the mold. You can tell if the lollipop is hardened by carefully holding the mold up over your head and checking to see that the candy is one even color. If you see dark spots, that means the candy is still wet in those areas. Freeze the candy for a few minutes longer. You can also check to see if the lollipops are ready by very gently tugging on the lollipop stick. If the chocolate moves, it should come out of the mold easily. If it sticks, it is not ready. Don’t tug too hard, or you may pull a lollipop out before it is completely hardened. place a baking sheet over the candy, turn the mold and the baking sheet upside down allowing the candy to fall out onto the baking sheet. If you have overfilled the candy mold and the lollipop has excess candy around the edges, allow the candy to warm up to room temperature. Then use a small knife to carefully cut off the excess candy. If you have a lot of excess chocolate and it is very thick, you may want to heat up your knife by running it under really hot water (then drying it) or by holding the knife blade over a flame. Then as you cut off the excess, the knife will melt the chocolate as you go, making it easier to remove. Brush off any crumbs using a pastry brush. Store your lollipops in a cool place preferably in an airtight container. 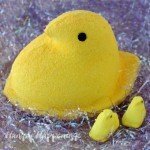 You can package them in clear cellophane bags and tie them with a colorful bow. If you color pure white chocolate you must keep it tempered in order to paint it into the candy molds, so the electric skillet method wont work well. If you do decide to use pure white chocolate, there is another alternative to coloring the actual white chocolate. Instead, you can paint your molds with melted and colored cocoa butter. You can keep the cocoa butter melted in the electric skillet, but you don’t want it to get hotter than 91 degrees Fahrenheit. Use the colored cocoa butter to paint the molds. It will dry quickly then you can pour melted and tempered pure chocolate over top. Let that harden, then pop it out of the mold. 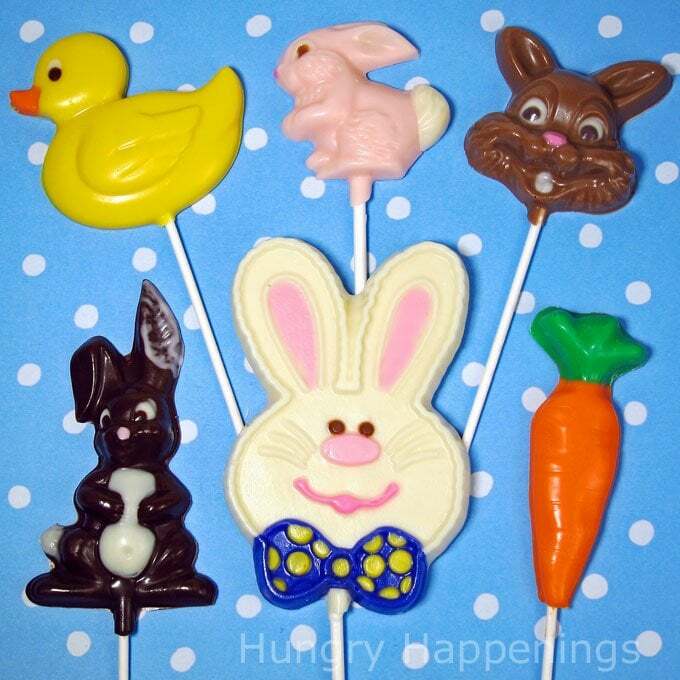 You can also color white chocolate or colored candy melts to make modeling chocolate. 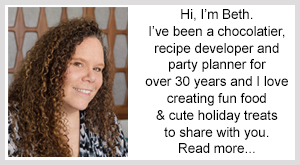 Be sure to check out my modeling chocolate recipe and trouble shooting tips page.